2. Mix together  one at a time - chopped walnuts, canola oil, sugar, salt, baking powder, cocoa powder, and flour. Blend with hands until uniform in color and texture. 3. Lightly grease the sides and bottom of a 10-inch tart pan and then add crust, pressing firmly into pan. Bake for 15 minutes, being careful not to burn the crust. 1. Combine tofu, water, vanilla, sugar, and salt in a large heavy-bottomed pot, breaking apart tofu with a whisk. Bring to a boil, lower heat, and simmer until liquid reduces and tofu turns a light golden color, approximately 45 minutes (to be done before we start to make the crust). 2. Chop the bittersweet chocolate and melt it over a double broiler (we’re going to put it right over the pot the tofu is in). 3. 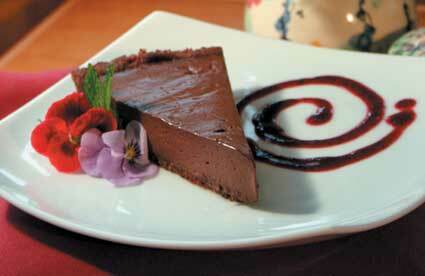 In a blender or food processor fitted with a metal blade, blend warm tofu mixture with melted chocolate until smooth. 4. Pour into pre-baked chocolate walnut crusts and chill thoroughly until firm.